Are you interested in learning more about a certain topic? 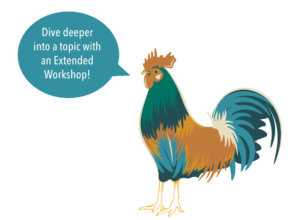 Register for one of our Extended Workshops! Taught by topic experts, these workshops are three hours in length and cost $30-$38. Seating is limited, tickets can be purchased online prior to the Fair or in the MREA Marketplace during the Fair. Please note that the Fermentation A-Z workshop is an additional eight dollars. Date: Friday, June 21 at 2:00 p.m. – 5:00 p.m.
• FERMENTATION FROM A-Z: HANDS ON AND FUN! Date:Saturday, June 22 from 2:00 p.m. – 5:00 p.m.